It’s been suggested that I might be good at leading ghost walks. Passive voice. I’m intrigued. I tag along for a walk right near my own neighborhood as conducted by a practiced expert. I want to witness what these walks are all about. He’s good at keeping it light, my guide, since the skin may crawl on its own without any guidance once the creepy facts are assembled. I’m skeptical of ghosts, naturally, and am trying to imagine how I could fit my own voice into this act. What could my role be? Pith helmet among the gullibles? Early on, the walk stops at my friends’ former house, and so I’m on alert. I’d spent a lot of time there. I’d been involved in the start of a project to rebuild its carriage house. I’ll have evidence to contradict any stories that are told, which just makes me nervous for our host. Something about a brassiere factory, a fire and a bicycle museum, and a little girl ghost and I recognize what must be the son of my friends as the temporary pyromaniac the guide spoke of, but that just doesn’t ring true. The very next day I head out with that same good lifelong friend to scour the junkyards – graveyards for cars – for seats which might fit the “kit-car” we’ve been working on, absurdly, for many months now. We’d sat alongside it on the Elmwood Avenue “cruise night” among the perfectly buffed and polished notables brought back to life from the grand old days of automobiles. 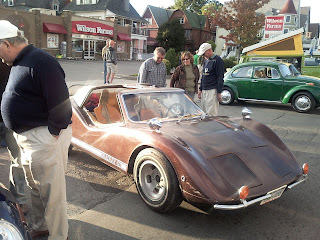 This “Bradley GT” cartoon fiberglass sports car on a VW Beetle chassis got attention just for its comic relief, but we hadn’t even had a chance to wash it, nevermind bringing it up to show quality. I’ll just bet the reason that it didn’t show up in the News’ spread of pictures from the show is that it turned up as a blurry aura when their photographer culled his shots. I told my good friend I had a bone to pick with him, speaking of graveyards in his basements where another motor project hangs like a side of beef now. How come he’d never told me about the ghost? He knew that I was attending these workshops for folks who write about the so-called paranormal. Well, matter of fact, he said, that house was indeed haunted. They didn’t move in as believers, but when a Pyrex dish jumped off its shelf and exploded on the floor of the walk-in pantry my friend’s wife’s Mom (I’m keeping my distance here) commented that the ghost didn’t like the pantry door being shut, and all the fun in the kitchen. There was one of a pair of Christmas candles which simply wouldn’t stay in its base overnight, and it was placed, not tipped, onto its side come morning. There were ketchup bottles cleaned up from among the debris left by the troublesome tenant downstairs who’d had to be evicted, arranged neatly on the windowsill and then rearranged overnight to different places without any breakage. And then there was the plaster plaque propped in plain sight in the attic - where nothing had ever been seen before - of a man’s bust and the caption “R. Robert Wagner,” as best my friends still remember. They called the ghost “Wagner,” and got along with it fine. Their infant son would talk to it, and track it with his eyes – not the pyromaniac from the ghost walk story who must have moved in afterwards according to the dateline we reconstructed. A church organist was murdered across the street while my friends’ house was being painted; right as the painters were eating lunch and looking toward that house. They were aware of nothing. Yes, I have corrections for the ghost walk, as well as new information. The brassiere factory was in the carriage house not next door in the bike “museum”– my friends called it a sweat shop and when we started rebuilding this carriage house - which remains disheveled but undisturbed until this day - they found piles of advertising brochures hidden in its walls when they pulled them open. I have a vague memory of that. The bicycle so-called museum might have been the home of a bicycle club, back when bicycles were the rage and they had six day races. They shoot horses, don’t they? We are so much more humane these days, our sweatshops are moved offshore and our champions wear armor. Our ghosts are mostly banished. I learned on the walk that most ghost sightings are of young girls, and that the second most common are women in white. I learned of the sacred dimensions of certain kinds of architecture; dimensions which just simply look haunted to the rest of us not initiated in ghost lore. My friends moved from that house to a larger one which used to be a brothel! But no ghosts there, although the place looked as though there should be. You know, hotels, brothels, theaters, nunneries, these are places where ghosts hold forth. Makes sense. But not everybody sees them, and I confirm that my friends aren’t all that excitable. I imagine the spin that I would give if I were to lead the walks. That of course the imagination will lead us to look in certain places, and that these places by their lore, by their sightlines, by their feng-shui in relation to all around them will be the places where energies will coalesce and it will be difficult to distinguish the real from the merely imagined. Now I don’t maintain that there is a stark distinction between the real and the maybe – looking forward, what separates our aspirations from reality is but a thin slice of will and determination. Plus so much luck and family conditioning and bodily endurance. Looking backwards in time then, when is the moment when a person becomes not one? If strong emotions are involved, and if there is influence beyond the skin’s boundary of real touch, can it all really hinge on a heartbeat? Do you really end where your skin does? Are boundaries ever clear, or are there only intervals and jumps? How small do things have to get before you hit quantum reality, Zeno? So I spent the better part of yesterday buffing up that old kit car. There were some stains which simply would not come out, and others which would. Some rust is permanent and some is amenable to steel wool. They treated me to dinner out with the entire extended family, my friends did, as reward for the car’s transformation. But then I spirited home right after dinner along with the mother-in-law since I’m not indulging sprits these days, ahem, and they all wanted to head out for a night on the town. Walking from theirs to my home alone along Elmwood a pristine white Bradley GT drove by, no kidding! (My daughter chides me for using feminine adjectives to describe the car over the phone as I was picking away at its blemishes) I called Pat and told him I could not have been more amazed had I seen a ghost. And hell, even if there is another of these cars in our vicinity, which I frankly doubt, why would it drive by me at just that moment? Just keeping it light here. No need to make the skin crawl. So, yeah, I’ve never seen a ghost. That beauty in white was real, and I’m certain of it.